It is a joyful time in the Diocese of Pensacola-Tallahassee. Pope Francis appointed a new Bishop for us. BTW. His name is pronounced, “Wok.” He presided at Mass last week but we completely missed it. But I’m sure we’ll get to meet him soon. The photo is of him at the Basilica of St. Michael the Archangel in the heart of downtown Pensacola. Here is some information from the official press release. On May 29, 2017, it was announced that Pope Francis has appointed Bishop-elect William A. Wack the sixth Bishop of the Diocese of Pensacola-Tallahassee. Bishop-elect Wack comes to the diocese from the Diocese of Austin (TX), where he has been pastor of St. Ignatius Martyr Parish. The Diocese of Pensacola-Tallahassee has been without a bishop since January 4, 2017, when Bishop Gregory Parkes was installed as Bishop of St. Petersburg. 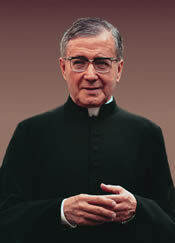 In the interim, the diocese has been under the guidance of Msgr. James Flaherty, diocesan administrator. Hello Path To Holiness fans. Do you listen to satellite radio? I’m taking a poll and interested in your response if you have a couple seconds. I know EWTN is on ch. 130 on Sirius XM. I also have a Pandora account and have stations like Gregorian Chant set up there. Let me know if listen to satellite. Do you listen to satellite radio? 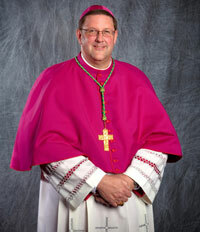 Say hello to our new Bishop, the Most Reverend Gregory L. Parkes. I was out of town this week so I couldn’t attend the ordination/installation. Here’s some information though from the Diocese website. Most Reverend Gregory L. Parkes was ordained a bishop and installed as the fifth Bishop of Pensacola-Tallahassee in a solemn Mass at St. Paul Catholic Church in Pensacola on June 5, 2012. Bishop Parkes was ordained by Archbishop Thomas G. Wenski, Archbishop of Miami, as the principal consecrator in the majestic Rite of Ordination of a Bishop. Bishop Felipe J. Estévez, Bishop of Saint Augustine, and Bishop John Noonan, Bishop of Orlando, were co-consecrators. All the concelebrating archbishops and bishops then followed suit, laying their hands upon the head of the new bishop in the gesture of ordination. Among those bishops consecrating Bishop Parkes were Bishop John H. Ricard, SSJ, emeritus of the diocese, and Bishop Martin D. Holley, auxiliary bishop of Washington, a native of our diocese. I was working all last week at a convention in Orlando, FL and only got bits and pieces of information on the devastation from the earthquake in Haiti. The more I learn the more my heart goes out to the people there and those who want to help. A lot of groups are asking for money right now but I would be very careful who you give money to. I feel most confident giving it to the Catholic Church relief services and this weekend the Bishops are asking for donations to the effort. Here’s a video clip from New York’s Archbishop Timothy Dolan about the situation and a copy of the letter sent to all Bishops from the USCCB. You can make a donation to Catholic Relief Services here. Pope Benedict XVI has declared a “Year for Priests” beginning with the Solemnity of the Sacred Heart of Jesus on June 19, 2009. The year will conclude in Rome with an international gathering of priests with the Holy Father on June 19, 2010. On this website you will find a number of resources to aid your parish’s celebration of the year for priests. There is also information regarding events for priests that will occur throughout the Year for Priests. I just got home from a trip to our Nation’s Capitol where I was able to attend daily Mass at St. Dominic’s. 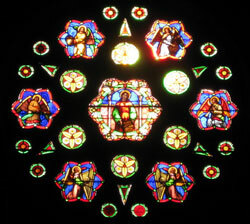 This is the stained glass window over the entrance to the church with the morning sun streaming through. It was an interesting time to be in Washington, DC with all the news about the North American flu, also called H1N1 flu. I was in a meeting with our U. S. Secretary of Agriculture, Tom Vilsack, who was bemoaning the fact that this has been mis-labeled as swine flu. It is not something that should make you worry about pigs and you can’t get it from eating pork. There are a lot of facts out now although you’re still hearing it referred to by the misnomer. That name is causing havoc with our farmers and not just those raising hogs. I’ve seen news stories that are taking this whole situation to extremes as they try to scare people in the name of ratings. Regular influenza causes many more problems and to date not enough is known about this strain to make the “sky is falling” comments and convince people to take precipitous action. Path To Holiness is now on Twitter. It’s about time I got started there. I’ve got the feed from the website updating the Twitter feed but I’ll also be posting to it separately and more frequently I’m sure. So feel free to follow along. BTW. Path To Holiness contributor, Chelsea Zimmerman, is also on Twitter. You can find her here. Itâ€™s simple. 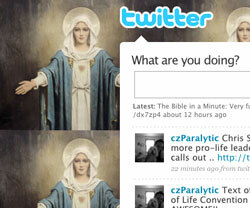 This is a tool to help build up the Catholic community on Twitter. Thatâ€™s it. Pretty short and to the point.